The best way to get your little boy involved in travel preparations and make him really excited about the future trip is to buy his own luggage. It is not an easy task to choose a perfect children’s trolley case among a great variety of options. Your little superhero definitely needs a super suitcase that will call an eye of everyone around. 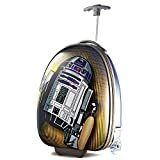 Whether the young traveler is a great fan of Marvel characters, Star Wars, monster or dinosaurs, be sure you will find an amazing boy’s trolley case that will be absolutely to his taste. We are going to help you a bit with a choice and offer our rating of Top 5 boy’s trolley cases. It might become a useful piece of information while searching for the perfect travel item. 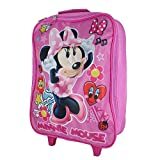 Get ready for your next holiday and pack more fun in this co-branded Disney and American Tourister suitcase. The luggage has a fantastic design featuring Star Wars characters and will be to the taste of any boy. It is made of quality ABS plastic that is extremely durable and resistant to damages. A reliable zip closure system will provide safe storage of the things during the trip. A large mesh pocket on the interior panel as well as garment straps will help to keep all goods in the right place. Side-mounted skate wheels and a mono tube pull-handle will make it easy to roll the suitcase even by the smallest travelers. The trolley case measures 18x13x9 inches and can be used as a carry-on when traveling by plane. It may look small but really fits a lot of things. Be sure, this amazing children’s hand luggage bag will catch an eye of everyone around. Looking for a cute boy’s trolley case? 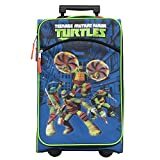 This functional luggage featuring Teenage Mutant Ninja Turtle may become a good choice. It is made of a quality polyester material which is extremely lightweight and water resistant. An extendable handle, as well as smooth moving wheels, will provide easy mobility. Even when fully packed, the little travelers will manage to roll it without anyone’s help. This suitcase is actually more spacious than it may seem. It measures 17x12x6 inches and will be a perfect option for short weekend trips, sleepovers with friends and even long-lasting holidays. A main zippered compartment, as well as big external pocket, will provide safe storage of the goods no matter where you go. The blinking lights on the front will definitely impress your little boy and catch an eye of everyone around. Make your child feel more like an adult with such a cool boy’s trolley case. This awesome Disney children’s trolley case is officially licensed and is made with a cute printing of Spiderman that will be definitely to the taste of a little boy. Study carefully the dimensions of the bag. It measures only 11x12x15 inches and won’t fit a great amount of the things. The compact size of a suitcase makes it perfect for short trips and sleepovers at Granny. A pull-handle, as well as well-moving wheels, provide easy mobility, so be sure even toddlers will manage to roll it. There is also a top handle that might become useful for parents to carry a travel bag in case the little ones are tired. This boy’s trolley case is made of a quality polyester material that is extremely lightweight and easy to clean. Perfect for any adventures, this children’s luggage will call everybody’s attention for sure. Make the trips full of adventure with such an amazing boy’s trolley case. It has a cute car design available in racing red and blazing blue. The hard case exterior is extremely durable and can be pulled along by the most demanding traveler. The racing bag comes with tri-wheel feature and standing feet for extra stability. Lightweight, compact and cabin ready at 53x34x20, the Fenza luggage will be perfect for any kind of journey. Choose between an extendable handle to pull along and a sturdy grab handle when tackling stairs. It is so easy to roll even by the smallest travelers. There is one large compartment with packing straps and internal mesh pocket for excellent packing organization. Some parents may find it not roomy enough, but nevertheless, the suitcase is great for short weekend trips and overnights. This children’s trolley case will make your little boy busy at the airport and excited about the journey. If your little boy needs a cute suitcase for a future trip, this children’s luggage featuring DC Comics characters will be a great choice. The hard-sided design together with nylon lining will provide safe storage of the things during the traveling. An aluminum telescopic pull-handle is dependable, functional and perfect for hassle-free transportation, while the side panel handles provide easy loading into cars. Four double-wheel multi-directional spinners will offer smooth and easy maneuverability. You will greatly appreciate excellent packing organization with a divided full-body main compartment and interior zipper pocket that will be useful for small items. This functional and well-designed children’s trolley case will be definitely to the taste of any boy. Make your trips full of fun and comfort with quality kid’s luggage. It is well-known that boys are not always careful with their things. For this reason, parents should do their best to find a high-quality boy’s trolley case that will last for more than a month. 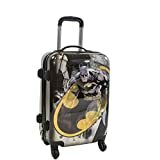 Among a great variety of luggage with popular characters, including Spiderman, the Cars, Marvel heroes, and others, you should choose between hard-sided and soft-sided suitcases. They differ in price and functionality, that’s why it’s important to purchase the one that will perfectly suit your boy. What kind of luggage does your little traveler prefer? Share your thoughts about the perfect suitcase for your boy. We have done our best to make this article pretty useful for parents who are looking for functional and well-designed boy’s trolley cases. If you liked this post, leave a comment below for us to know we are moving the right way.